We know you want to do the best for your pet but faced with a plethora of food options how can you know which one to choose? Clinical veterinary nutritionist Dr Marge Chandler says we should look for a couple of key words on the label. “Dog and cat owners need to make sure that someplace on it, the package says it’s a complete diet – or it might say ‘complete and balanced’,” she says. Though these are extreme health conclusions, Marge points out that animals that miss out on key nutrients may not show any signs of a problem for a long time. So owners should read pet food labels carefully rather than presume that all is well if their animal is gobbling its food happily and seemingly well. What else do owners need to know? Marge says that it’s a good idea to pick a food that matches your pet’s life stage. There is a lot to ignore on pet food labels too, Marge notes. Words such as ‘gourmet’ and ‘hypoallergenic’ mean very little, she says, and are often used simply to sell food as there is no legal definition for these terms. In other words, they are meaningless. 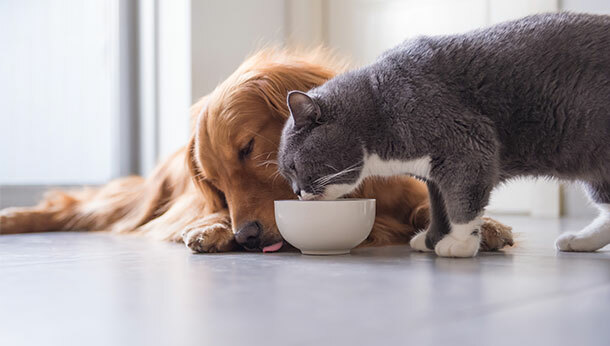 For oral health, there are some specific dry kibbles that have an abrasive, toothbrush action on the tooth and are designed to improve oral health and to remove plaque to prevent gum disease. However, Marge says most standard dry pet food won’t do so. “Toothbrushes are best for this,” she says. When it comes to feeding pet rabbits, the Rabbit Welfare Association & Fund advises that owners should feed a diet that mimics what rabbits would eat in the wild. This should be around 80 per cent hay or grass, 15 per cent leafy greens and just five per cent pellets. Fresh, dust-free hay or grass helps wear down rabbits’ constantly growing teeth to prevent dental problems. Though a good source of vitamins and minerals, if rabbits rely too heavily on commercial food, they can tend to eat quickly and then become bored (and possibly destructive!). Other small animals or rodents need careful attention too. For example hamsters need high levels of protein while guinea pigs must have vitamin C. It’s best to check RSPCA recommendations for individual species and, as with cats and dogs, read pet food labels carefully to ensure that any commercial food you buy provides a balanced diet.